The image on the 60-inch, wall-mounted television is frozen because new Los Angeles Rams head coach Sean McVay plans to make a point. “You’ve got to see this,” McVay says while he grabs the remote and leans back in his desk chair after a recent practice. At the top of the screen, running back Todd Gurley is split out wide left on the 35-yard line, which is about the last place on a football field you’d expect to find Gurley, against linebacker Bryce Hager. McVay hits the play button and just smiles. From the snap, Hager is clearly overmatched against his teammate. On a “go route,” Gurley speeds straight down the field, never breaking stride as he catches a perfect pass from quarterback Jared Goff around the 10-yard line and strolls into the end zone. And McVay’s video fun is only getting started. Next, he moves to a clip of Gurley catching a slant pass from Goff and outracing linebacker Alec Ogletree for a big gain. McVay punctuates the revealing session with several clips of Gurley moving around in various formations and torching one defender after another on both running and passing plays. The theme of McVay’s show is obvious: The Rams are still all about rolling with Gurley. 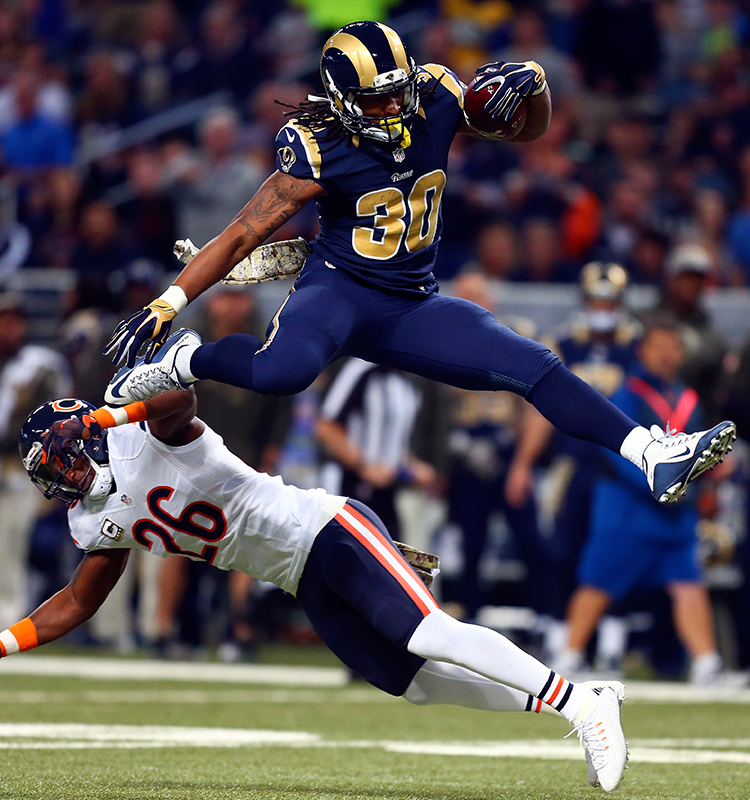 Todd Gurley #30 of the St. Louis Rams leaps over Antrel Rolle #26 of the Chicago Bears. After experiencing a sophomore slump during the Rams’ woeful 2016 season, Gurley, the 2015 Associated Press Offensive Rookie of the Year, is determined to bounce back. Under McVay, he’ll get every opportunity to try. One of the league’s most talented all-around backs and the youngest head coach in modern NFL history are totally in sync. An offensive whiz kid during his time as the Washington Redskins’ playcaller, McVay, 31, knows how to put gifted players in the best position to display their gifts. Forget about the Rams’ lack of imagination on offense. That’s in the past. McVay will spice things up. Gurley is the centerpiece of McVay’s blueprint to reinvigorate the Rams, who are trying to get re-established in Los Angeles. Getting Gurley back on his game would be a great way to start. At the Rams’ training camp on the campus of the University of California, Irvine, the process is in full swing. If you know how McVay operates, you’ll see in what the Rams are doing many similarities with the Redskins, who finished third in total offense last season. Sharp pre-snap movement, strong receiver route combinations, solid overall design — it’s all there. The difference from what the Rams used to do also jumps out. Todd Gurley #30 of the Los Angeles Rams warms up before the game against the Buffalo Bills. Former Rams head coach Jeff Fisher was roundly criticized for the team’s uninspiring performance on offense. In Fisher’s final season, the Rams finished last in total offense. Gurley’s production plummeted. The 10th overall pick in the 2015 draft, Gurley failed to reach the 1,000-yard mark in 2016, finishing with 885 rushing yards and a disappointing 3.2-yard average with six touchdowns. Despite playing in only 13 games as a rookie, Gurley rushed for 1,106 yards (with a 4.8-yard average) and 10 touchdowns. He became the first rookie in NFL history with at least 125 yards rushing in four consecutive games. In Rams history, only three rookie runners have gained at least 1,000 yards: Eric Dickerson, Jerome Bettis and Gurley. When you begin your career in the company of two Hall of Famers, you’re off to a great start. No one more so than Gurley. 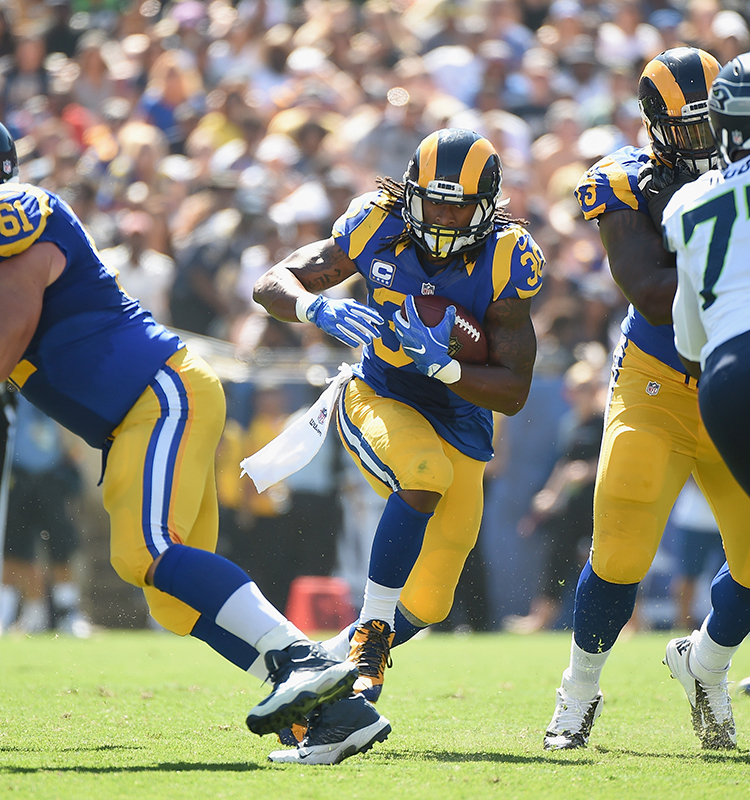 Todd Gurley #30 of the Los Angeles Rams cuts through the hole during the second quarter of the home opening NFL game against the Seattle Seahawks. Quickly, McVay made changes that suited Gurley. The team’s intensity level is way up. “Being with Fish last year, the environment was real cool and laid-back. 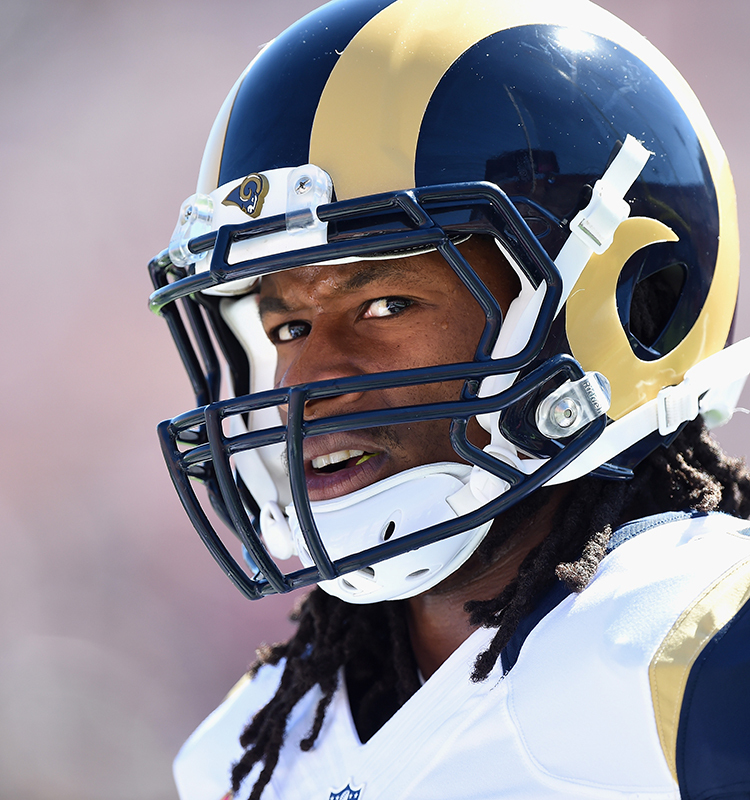 It was player-friendly,” Gurley said. “With our new coach, Coach McVay, it’s different. It’s more detail-oriented. People are a lot more locked in. McVay would be the first to tell you that Gurley already has made his job easier. There’s just so much McVay can do with such a talented back. “He works extremely hard, and he’s ultraconscientious,” McVay said. “If there’s something we fix, then he gets it right the second time. He’s a complete back. He has the ability to run a variety of schemes because he has a great, natural feel as a runner. He’s got the speed. He’s got the size. 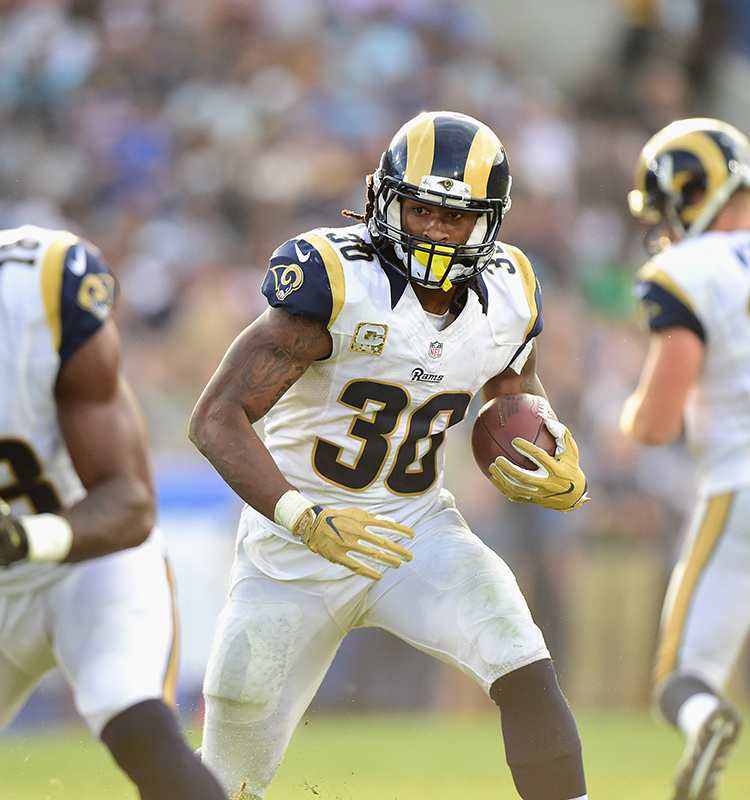 Todd Gurley #30 of the Los Angeles Rams rushes for a first down. Last season, Gurley had little room to maneuver. The Rams’ offensive line was among the league’s least effective. To hear Dickerson tell it, even he would have rarely broken free working behind that group. The Rams moved to bolster the weakest unit on their roster by signing two-time All-Pro left tackle Andrew Whitworth. They also added veteran center John Sullivan. McVay is optimistic. Gurley, too. A strong comeback by Gurley could benefit Goff as well. The Rams traded two first-round draft picks among six overall (they also got two back) for the right to select Goff first overall in the 2016 draft. He went winless in seven starts and generally looked like a quarterback who should have remained on clipboard duty all season. The Rams made another recent move aimed at aiding Goff, trading for talented wide receiver Sammy Watkins. The Rams need Goff to succeed. Gurley can help make that happen. With the Rams’ new offense, there’s much to see. Gurley will get a lot of attention. He also could wind up gaining a lot of yards again.